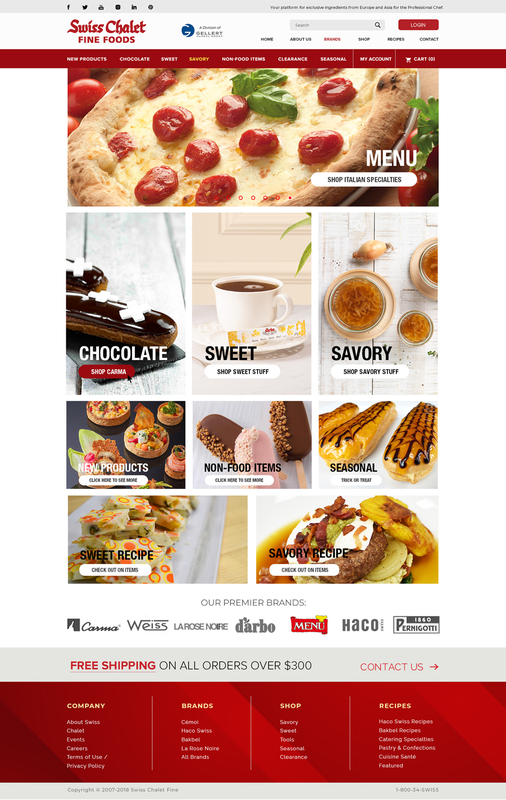 In over 4 years of Ecommerce engagement, we have made many contributions to Swiss Chalet Fine Foods (SCFF), a subsidiary of Gellert Global, when we took over an aging infrastructure built on a closed-source customer platform and redesigned and rebuilt the site on Magento Enterprise. Addressing many functionality issues such as a Quick Order and Search functions, we have instituted a vastly improved, user-friendly interface that puts product front and center, installed a dynamic, intelligent “Search”, crucial for modern Ecommerce, we’ve integrated with the corporate group-level ERP, their Sales Team now receives dynamic notifications for new customers and orders, and the site provides up-to-the-minute order info regardless of whether the order was placed by call, fax, or through the web interface. We’ve also implemented a customized Dynamic Order Tracking solution and upgraded the site to the latest in Ecommerce: Magento 2, providing a faster, more responsive shopping experience. Our daily support and monthly reporting, which includes product and sales rep data and utilization trends in addition to Analytic monitoring, drove SCFF’s decision to fully mobilize the interface as both their site and worldwide web traffic are rapidly mobile-trending. Our team is responsible for the maintenance and security of a site that drives an annual revenue in the tens of millions of dollars. Transaction value, site utilization, and web customer orders are all over 150%, revenue from automated orders has increased by over 288% YOY. And in terms of performance, we have achieved a monthly uptime of over 99%.